Our Scentsy Apple S’mores Scent Circle gives off just the right amount of refreshing sweet fragrance. The smell of ripe harvested apples, with rich cinnamon glaze will lead you down memory lane. As you inhale, a touch of coconut milk lends a tantalizing twist to the classic toasted marshmallow, vanilla crème and warm cedar wood. Perfect for refreshing small spaces like garbage cans, closets, a locker, your vacuum bag, next to your desk, and of course your car. 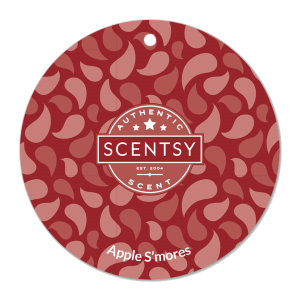 Our Scentsy Apple S’more Scent Circle is a 3″ round paper board full of enticing fragrance. Instantly freshen your small spaces with our signature scent of Apple S’mores. Our Scent Circles are available in over 80 aromatic fragrances, and will conjure up a fragrant atmosphere in seconds. Open your Scentsy Apple S’mores Scent Circle, hang freely in your car, and you’ll enjoy 2 – 4 weeks of penetrating fragrance. Take advantage of our Apple S’mores Scentsy online discount. When you buy any 5 Scentsy Scent Circles, you’ll get an additional Scentsy Scent Circle for FREE (you can select a combination of Scentsy Scent Circles of your choice). Bring back the crisp fall season with our Apple S’mores Scentsy bar refill. Our Scentsy candle bar refills are a high quality, soft wax. When used with our Scentsy electric candle warmers, you’ll enjoy the best quality and long lasting home fragrance in the industry. Simply break off a piece of the scored Scentsy Bar and add it to your favorite Scentsy Warmer dish. Our Apple S’mores Room Spray is ideal for bathrooms, travel trailers, hotel rooms, and other times when you just need a quick spritz of fragrance.